How I gained it: I have been overweight my entire life, but I gained the majority of the weight over the past five years. My dad was very sick and in the hospital for a long time, and I used food as an escape. I ate fast food three or four times a week; I was a fast food drive-thru queen! My favorite was McDonald’s, but I would also go to Wendy’s and Burger King. I always felt happy while I was eating the food, but I would feel guilty when I finished. I never got out of the car, thinking that no one would see how big I was if I used the drive-thru. I ordered super-sized meals, but drank a Diet Coke with them, kidding myself that would make a difference. I do miss Ronald, Wendy, and the King, but they were no friends of mine. They were my worst enemy. Breaking point: After my father passed away from complications from diabetes, heart disease and high blood pressure, I hit rock bottom, and I was still using food as comfort. I went to see the doctor, and my blood pressure was very high. For the first time, I had health issues, and it scared me. Right around that time, I had to travel for a month on business/pleasure and had to take 14 different flights. I was so mortified that the seat belts didn’t fit me! The worst part of the whole experience was that most of the flight attendants automatically brought the seat belt extender to me. They knew just looking at me that I would need it. It was horrible! I knew I was big, but I tried to block out the fact that most people could see how big I really was. 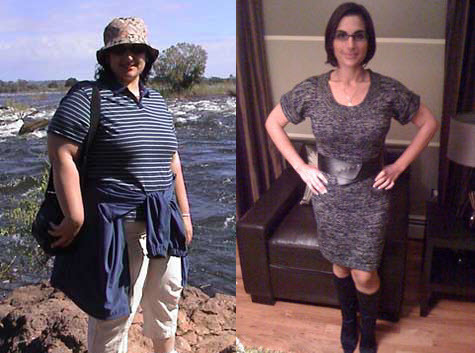 RELATED: "Why I Lost the Weight"
How I lost it: I joined Weight Watchers about 15 months ago, and it changed my life. I used to be inactive. I would lie on the couch all weekend long, and during the week, I took taxis to all my customer meetings inManhattan. Just walking up a flight of stairs would leave me winded. I had a closet filled with clothes — size 24/26 — but nothing fit me; I used to just wear a pair of black pants to work everyday. Now I wear a size two, and there isn’t a single pair of black pants in my closet! I walk everywhere, and I workout for at least an hour almost every day. I’ve never felt comfortable in a gym, so I have my own routine at home. I love my Wii Fit and other Wii workout games because they’re fun and don’t make working out seem like a chore. I also like to do Pilates and Turbo Jam DVDs. I follow the Weight Watchers plan and try to eat a very healthy, balanced diet. I work in sales, so I have to take customers out to lunch and dinner, sometimes three or four times I week. I learned that I don’t need to avoid those situations, I just need to make smarter choices when eating out. It can be done! I lost the weight and maintained my weight loss while eating in restaurants. I’ve also totally given up fast food. Those calories just aren’t worth it to me anymore. 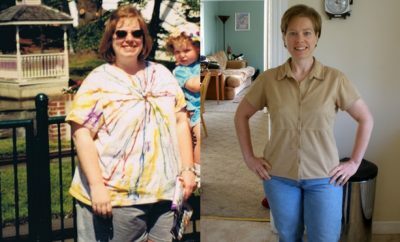 I’m training right now to work for Weight Watchers, and I’ve never felt better! Caroline has maintained her weight loss for three months and lost another two pounds last week. Cara – you might enjoy these stories. Awesome! Like really… SO awesome! I sooo needed to read this! You look amazing! You are absolutely right, fast food is not worth it! Good for you and keep up the good work!!! Call your local ymca/ywca. They offer scholarships for memberships. Some communities have weight loss support groups which are free. This sounds exactly like me…I wish I could find the self discipline in myself to change. 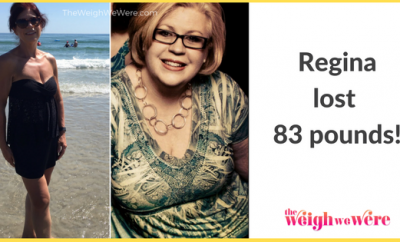 Weight Loss Success Stories: Regina Lost 83 Pounds And Found A Fresh Beginning!